This #OREOCookieBalls shop has been compensated by #CollectiveBias, Inc. and its advertiser. All opinions are mine alone. The holidays are quickly approaching and I love baking and making homemade gifts for my friends, family and neighbors. From cookies, to mini loaves, cakes to brownies and most especially candy and truffles. For the past several years we have been making OREO Cookie Balls to share with friends and family and they are always a big hit. Super easy, three ingredients (plus any add on’s you want) and always look so festive all packaged up and ready to go. Have you ever made OREO Cookie Balls? Since I was a kid Oreo’s have always been my favorite go-to snack. Especially when I’m craving chocolate. There’s just something about those little sandwich cookies that make the world right. When holiday time rolls around, we love making these OREO Cookie Balls because there are so many different ways to make them and change them up to be your own.They make a great gift idea for friends and neighbors. 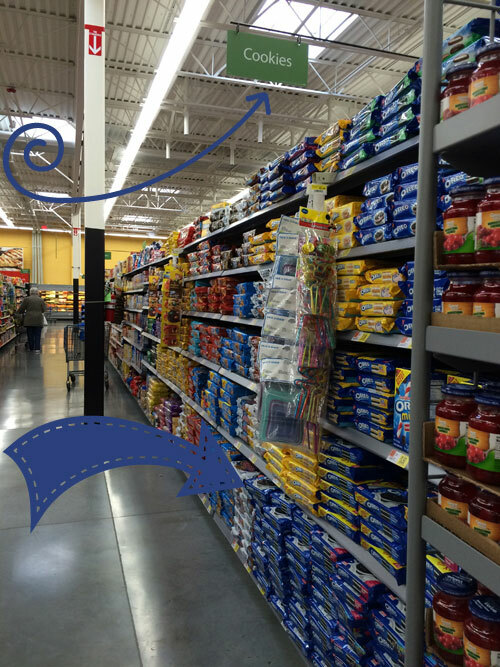 So we hopped on over to Walmart and headed straight for the cookie aisle and found the Oreo’s right away. They have a huge section with all the different flavors. It didn’t take long to settle on this years flavor, since Peanut Butter OREOS are some of our favorite anyway. 1. Crush your OREOs. We used Peanut Butter OREOs for this recipe. I used my food processor to make crushing them easier. Sometimes I will put them all in a bag and crush them, but its difficult to get them into a fine crumb size evenly doing that. So the food processor just works better. Once you have your crushed OREOs, toss them into your mixer with the softened cream cheese and mix up well until everything is incorporated. 2. The picture above is what your mixture should look like. We call it OREO dough and it can be used for so many other things, but today we are making Oreo Cookie Balls, that’s what it is. 3. Roll the Oreo Dough into 1-inch balls. You should be able to get 48 of them as long as you don’t make some of the balls to big. haha We do this each time, but then we just take away from or add to and re-roll. Pop them in the freezer for about 10-15 minutes to get them plenty cold. It helps the chocolate stick and keeps the dough solid. 4. Once the Oreo Cookie Balls are ready (or while they are freezing), time to melt the chocolate. Stir often so the bottom doesn’t burn and don’t turn it up too high. Let it melt slowly. 5. Next, toss your gingerbread cookies into your food processor and again give it a whirl turning those gingerbread men (or plain old gingerbread cookies) into crumbs. We used a homemade gingerbread cookie recipe but you can use store-bought gingerbread men. It certainly doesn’t matter. 6. Now the fun part. Insert a toothpick into one of the Oreo Cookie Balls and roll it through the chocolate. Get it all covered with chocolate all the way around. 7. To remove the toothpick, you can kind of gently shake the Oreo Cookie Ball, or you can simply use another toothpick to push it off. Push it off onto parchment paper on a large pan that will fit in your refrigerator. You will more than likely end up with a small hole at the top. Use the toothpick to smooth the chocolate over the hole. If you are rolling, coating or sprinkling the Oreo Cookie Balls with anything, you can ignore the hole, it won’t matter. 8. 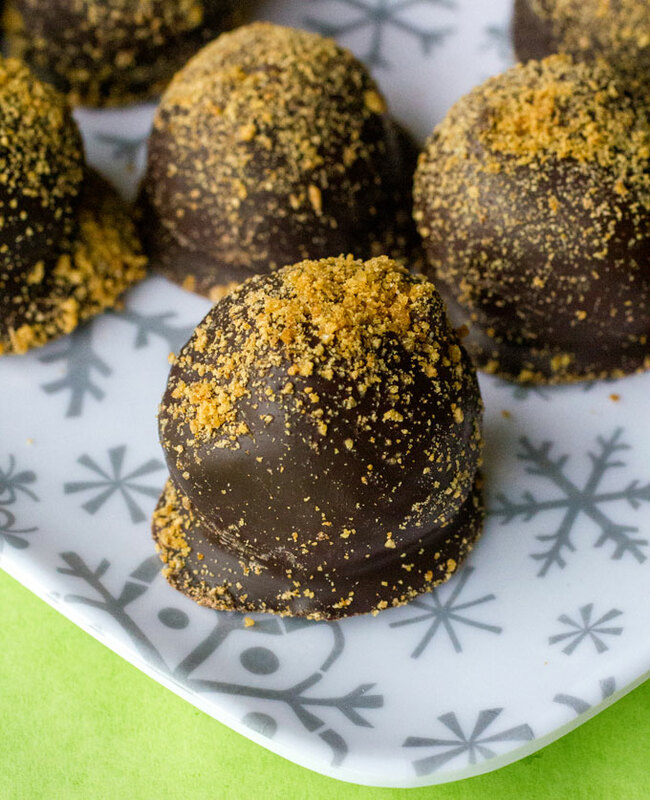 Sprinkle your gingerbread crumbs over the top of each truffle. You can roll them too if you’d like, but we just wanted to make them look a little like truffles. Pop the pan in the refrigerator for at least an hour to help them finish drying. If you are giving your OREO Cookie Balls as gifts, find some cute containers and tissue paper and package them up that way. Deliver as soon as possible. Mix cream cheese and OREO cookie crumbs until blended. Shape into 48 (1-inch) balls. Freeze 10 minutes. Dip OREO cookie balls in melted chocolate; place in a single layer in shallow waxed paper-lined pan. 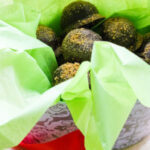 Sprinkle gingerbread crumbs on top as soon as the OREO Cookie balls are on the waxed paper. Or allow to sit for a couple of moments and then roll the OREO Cookie ball through the gingerbread crumbs. Refrigerate for 1 hour or until firm. For more great ideas and ways to make OREO Cookie Balls your own, be sure and check out the #OREOCookieBall Pinterest Party happening on Pinterest on Saturday, December 6, 2014 at 12pmET. Check out this coupon for 50¢ off a package of OREOs! LOOKING FOR MORE EASY CANDY RECIPES? mmmmm love this holiday twist on Oreo Balls!! I am totally making these this season, you had me at gingerbread never mind peanut butter or oreo!! They are just ridiculously good! We couldn’t stop popping them into our mouths, and had to refrain so we could give batches away! haha Enjoy Tammi! I used Peanut Butter Oreo Cookies for this recipe. That’s where the peanut butter came from, but you can use any type you want and change the Oreo Balls up to be whatever you’d like.